Tidal inlets can significantly modify the alongshore sediment flux through a stretch of coast and thus exhibit a broader influence on the health and fate of coastal systems. 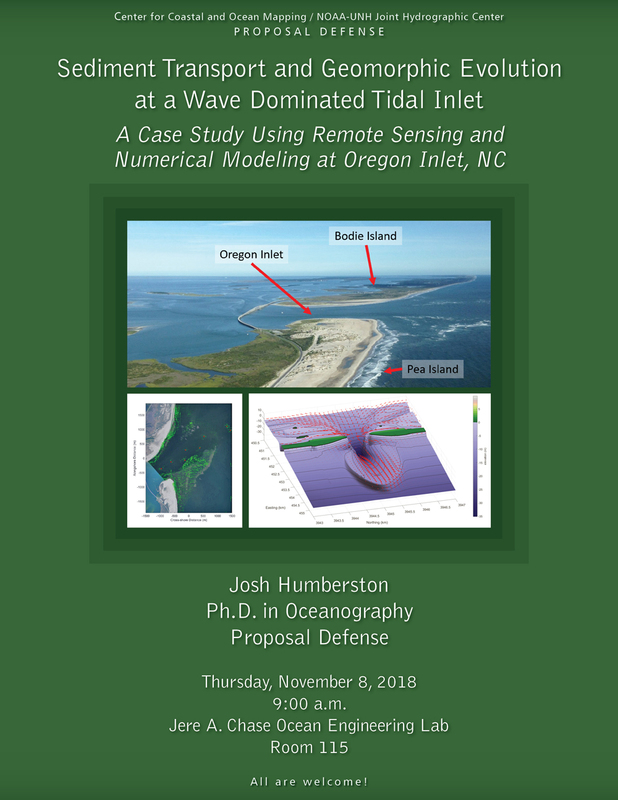 This proposal discusses current and ongoing worked aimed to pair remote and in situ observations with a numerical model to track sediment transport and the resulting morphologic evolution at Oregon Inlet, NC, a large and dynamic inlet system along one of the United States’ most extensive and vulnerable barrier island systems -- the Outer Banks. Initial observations include nine months of X-band radar data collected at the inlet to measure wave breaking patterns over the ebb-delta system, which when time averaged, serve as a suitable proxy for the underlying morphology. Various motion tracking algorithms were applied to the time series of morphological states to determine likely sediment pathways. Early results found a close correlation between waves and alongshore bedform movements as well as through inlet sub-tidal gradients and cross-shore bedform movements. Ongoing and proposed work seeks to simulate these transport pathways and reveal their forcing mechanisms through numerical modeling of the systems hydrodynamics, waves, water level variations and the resulting sediment transport and morphodynamics. Josh Humberston completed his B.S. in geology with a concentration in coastal and marine geosciences at the University of Delaware. Through an NSF-funded Research Experience for Undergraduates (REU) and his senior thesis research project, he used naturally occurring radionuclides that adsorb to fine grain sediment to predict seasonal deposition patterns in the Delaware Estuary. He then completed an M.S. in oceanography at UNH through CCOM/JHC where his research focused on predicting surficial mud fraction in the Little Bay estuary using a statistical decomposition of single-beam sonar data. Following that, Josh spent some time on NOAA’s Okeanos Explorer as a hydrographer and then completed a year of Ph.D. work at Coastal Carolina University in Conway, South Carolina where he worked analyzing radar observations of surface waves. Josh spent a summer working with the US Army Corps of Engineers at their Coastal and Hydraulics field facility in Duck, NC through the PATHWAYS program. He then received a SMART scholarship through the Department of Defense (DoD) and has returned to UNH to complete his Ph.D. in oceanography. His research will take an interdisciplinary approach to better explain shore-oblique sandbars: how and where form and how they evolve. He will also explore tidal inlet ebb-shoals evolution and the varying sediment pathways hosted in these systems. Josh's research Interests are coastal morphodynamics (sandbar and shoal evolution), coastal influence of ocean surface waves, coastal geologic influences, estuarine sediment dynamics, and remote sensing (acoustic and X-band radar).